There's more than meets the eye with Easter Island's famous stone heads. As it turns out, the sculptures have bodies buried beneath the Earth. Although this discovery is new to the general public, archaeologists have known about it for over a century. Easter Island, located almost 2,00 miles off the coast of Chile, is one of the most isolated islands in the world. 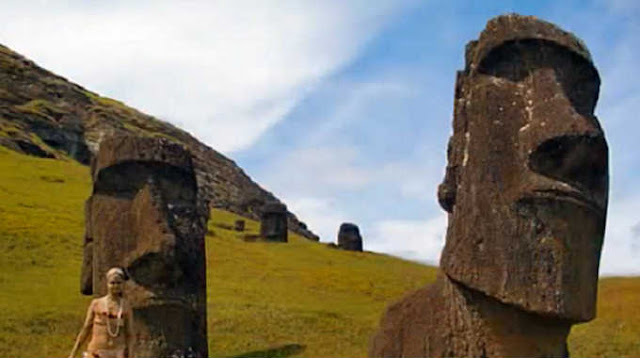 The statues, also referred to as "moai" were carved from volcanic rock between 1250 and 1500 CE by ancient Polynesians. The tallest of the statues reaches almost 33 feet and weighs an incredible 82 tons! They are believed to represent the indigenous people's ancestors, and are covered in indecipherable writing called petroglyphs. An excavation team documenting the carvings on the famous statues have been working on preserving the stone that was once covered beneath the ground. Watch the video below to learn more amazing facts about this ancient civilization!